Outlining its agenda for five years, the government on announced a slew of measures to push growth and create jobs, which will include encouraging investment and creating a predictable, transparent and fair environment. Addressing the first joint sitting of Parliament after the recent Lok Sabha elections, President Pranab Mukherjee said the Narendra Modi government will initiate a series of social, healthcare and infrastructure programmes while asserting that there will be 'zero tolerance' towards terrorism and extremism, besides violence against women. He said the government will revive 'Brand India', riding on its strengths of five 'T's -- tradition, talent, tourism, trade and technology -- and will pursue foreign policy on the basis of "enlightened nationalism" and mutually beneficial relationships. 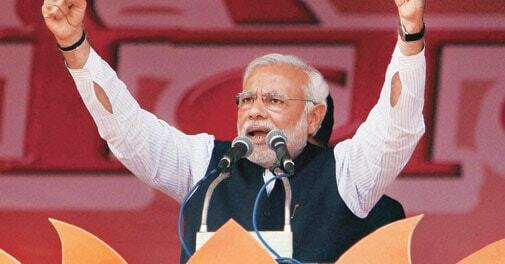 "The people of India have given a clear mandate. They want to see a vibrant, dynamic and prosperous India. They want to see a resurgent India regaining the admiration and respect of the international community," Mukherjee said in his 55-minute address. "Brimming with hope and expectation, they want quick results. With three 'D's of democracy, demography and demand on our side, ... we must rise to the occasion to fulfill these great expectations. In 60 months from now, we should be able to say with confidence and pride that we have done it," he said. Noting that the country is passing through an "extremely difficult phase" on the economic front, the President said that GDP growth has been less than five per cent, tax collection has declined and inflation continues to be at an "unacceptable" level. "Thus, putting the Indian economy back on track is paramount for my government. We will work together to usher our economy into high growth path, rein in inflation, reignite the investment cycle, accelerate job creation and restore the confidence of the domestic as well as international community in our economy," he said. In this context, he said the government will create a policy environment which is "predictable, transparent and fair". The government will embark on rationalisation and simplification of the tax regime to make it "non-adversarial and conducive to investment, enterprise and growth," the President said. Observing that the government will make every effort to introduce GST while addressing the concerns of the states, he said "reforms will be undertaken to enhance the ease of doing business." "My government will follow a policy of encouraging investments, including through FDI, which will be allowed in sectors that help create jobs and assets," Mukherjee said. Government will also strategically promote labour- intensive manufacturing and expand job opportunities by promoting tourism and agro-based industries, he said, adding that employment exchanges would be transformed into Career Centres connecting youth with job opportunities through the use of technology, counselling and training. Government will set up world class investment and industrial regions, particularly along the Dedicated Freight Corridors and Industrial Corridors spanning the country while encouraging domestic industry to innovate and collaborate internationally, he said. "It will strive to move towards a single-window system of clearances both at the Centre and at the states through a hub-and-spoke model," the President said. To strengthen India's global trade share, procedures will be simplified and trade infrastructure strengthened to reduce transaction time and costs. Besides, export potential of small-scale and handicraft sectors will be encouraged, he said. Terming the "lack of robust infrastructure" as a major impediment, he said government will chalk out an ambitious infrastructure development programme over the next 10 years. "A fast-track, investment friendly and predictable PPP (public private partnership) mechanism will be put up in place," Mukherjee said, adding that a Diamond Quadrilateral project of high-speed trains will be launched and a network of freight corridors with specialised 'agri-rail networks' for perishable agricultural projects created.